In 1971, he was a Vietnamese student who had just met the love of his life. She was a North Korean worker who knew she was forbidden to love him back. It took 31 years before Pham Ngoc Canh, the Vietnamese student, and Ri Yong Hui, the North Korean woman, were finally married. 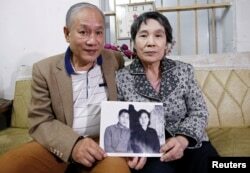 They wed in 2002, after North Korea took the unusual step of permitting one of its citizens to marry a foreigner. Now she is 70 years old and he is 69. They live in an apartment in the city of Hanoi, in Vietnam. Today, Vietnam is one of Asia’s fastest growing economies, but when the couple met the country was struggling. It was at war with the United States and divided in two. So the North Vietnamese government sent 200 students, including Canh, to North Korea to gain the skills the country would need to rebuild. But romantic relationships with foreigners are strictly forbidden in North Korea. They were also forbidden in Vietnam at the time. However, Ri and Canh exchanged letters. In time, she agreed to let him visit her at home. He had to be careful. He knew another Vietnamese man had been beaten when he had been found with a North Korean woman. He repeated the trip every month until 1973, when he returned to Vietnam. He was the son of a high-ranking party official, and he was expected to have a bright future with the state. But he refused to join the Communist Party. “I just couldn’t agree with a socialism that stops people from loving each other,” Canh said. In 1978, Canh asked to return to North Korea with a group of Vietnamese engineers. He arranged to meet Ri, and even wrote a letter asking the North Korean leadership for permission to marry her. But Ri said the visit broke her heart. She did not believe her government would agree to his proposal, and she was afraid the two would never meet again. So Canh did not send her the letter. Instead, he asked Ri to wait for him. Later that year, Vietnam invaded Cambodia and fought a border war with China. North Korea and Vietnam were on opposite sides of the conflict. Ri and Canh stopped writing. Years passed. Finally, in 1992, Ri sent Canh a letter. She told him that she still loved him. But the two still could not meet, let alone marry. Then, in the late 1990s, North Korea faced a deadly famine. By now, the Vietnamese government was connected to the West, and it refused to send aid. But Canh was so concerned for Ri and others that he raised donations of rice to send to North Korea. When North Korean officials learned of Canh’s act of kindness, they agreed he could marry Ri – but only if Ri kept her North Korean citizenship. 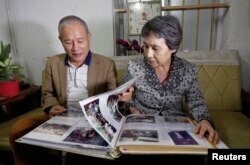 In 2002, the couple finally married in the Vietnamese embassy in Pyongyang. “In the end, love beat socialism,” said Canh. Canh and Ri are hoping the upcoming meeting between U.S. President Donald Trump and North Korean leader Kim Jong Un in Hanoi will help end hostilities between their countries. Hai Do adapted this story for Learning English based on a report from Reuters. Kelly Jean Kelly was the editor. The video was produced by Reuters and Dorothy Gundy.